You know how I love to roast veggies, right? Well this is such a super easy one. I usually don’t roast my green beans because they are not my husband’s favorite vegetable so when I cook them I like to do Green Beans, Onions, and Walnuts because I just love that. Since my hubby is not that fond of green beans, I don’t cook them that often and I save my cooking of them for that recipe. But recently I just wanted something to throw in the oven. Like I normally do. Wash it, season it, throw it in the oven, and walk away. That is one reason why I love to roast veggies. Well, we just happen to have received green beans in our produce box . . . so that is what I ended up roasting. You know I always love easy, and easy right now is what I need because we are having to spend so much time just sitting in the room with the cats. I mean we don’t HAVE to, but we do. I have found in talking to people who don’t have cats, that it is a common misconception that cats don’t like company. People think cats are super independent. While they might be more independent than dogs, they still like their people’s company. They might not want you to even pay attention to them, but they like you to be in the room with them. Especially when they are locked in a room and they can hear you out in the house, then they really want to be out there with you. Cats like to be WITH you. These girls have been in three different places since June 1 so we want to let them know that they are part of a family now, so my hubby and I spend a lot of time in the room. This isn’t so much about the recipe (because it is so easy) as the idea of roasting green beans. It could be that someone hasn’t thought about doing it yet. 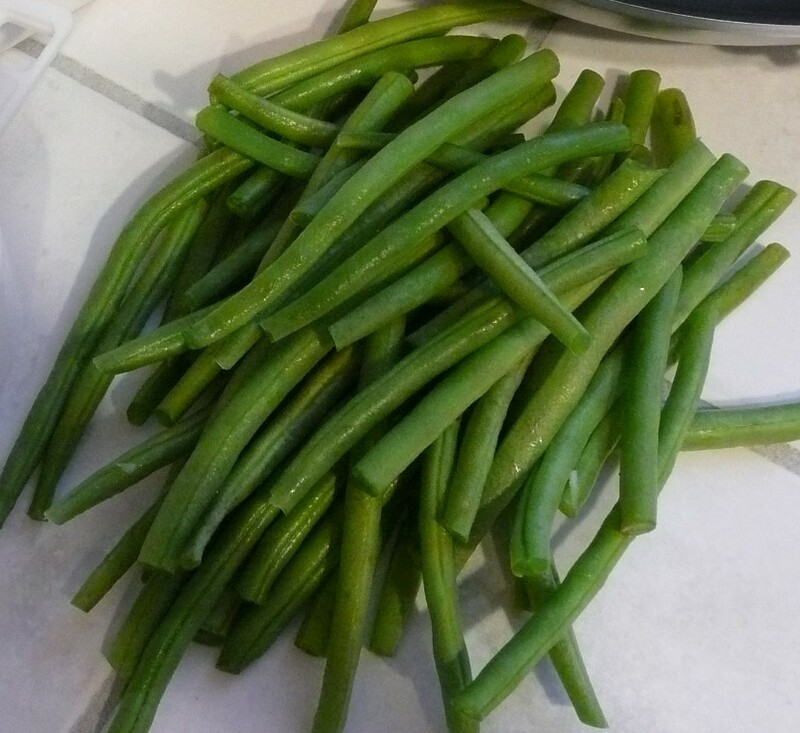 Wash and trim the green beans. Line a cook sheet with parchment paper. Put your beans on the pan. Then drizzle the oil over the beans. Toss the beans so the oil gets on all the beans. Spread the beans out so they are one layer on the sheet. Sprinkle the beans with salt, garlic, and the pepper. Put the beans in the oven for anywhere from 20 to 45 minutes. How long you cook your veggies is up to you. You can check on them and decide how well done you like them. Sometimes I like them not so done and sometimes I like them well done. When roasting I am ok with them well done. With other methods I like them less done. Of course you can season them with whatever you would like. Salt, garlic, and pepper is simple seasoning. And sometimes that is nice. Do you like green beans? Do you like them roasted? How do you cook green beans? You might know from my various posts that I don’t really like beans. Beans, the legume, the protein-fiber-rich nutrient. Not my favorite thing. I like green beans. And I am ok with garbanzo beans. I will eat kidney beans but only in two things, the two bean salad (click here for recipe) or my Sausage, Beans, and Rice adaptation (click here for recipe). But otherwise I don’t eat beans. You may also know that I bought some dried garbanzo beans in bulk once. Since I didn’t know what to do with them I turned to the internet for some education. The internet said there were two ways to get the beans ready for a recipe: one was a “quick soak” idea, it requires cooking and doesn’t seem quick to me at all. The other was a soak-over-night way. I tried them both. I didn’t really feel there was a different outcome to the two methods, but obviously the methods themselves were different. I preferred the overnight soak because it doesn’t require any real time that I have to be in the kitchen. Rinse the beans, fill the bowl with water, let them soak, changing the water a few times as they soak. Since I haven’t taught a Nia class in the area of San Jose where I bought the last dried beans, I decided to buy some organic dried garbanzo beans online. To get them ready for cooking I opted for the let-it-set method. I didn’t time the soak because I had done it before and I know that overnight is good enough. I know I let them set from one morning, until the next afternoon. Then I rinsed them and put them on the pan to roast. Apparently not all beans can just be soaked for about 30 hours. Apparently some HAVE to be cooked — as in boiled. These beans did not come out well just soaking. I didn’t know that until I was already roasting them. I had a huge bowl soaking so when I did the roasting I had only used about half. So I figured that if I let the remaining beans soak longer they would be fine. So I left them soaking until the next day. Throughout this soaking period I had drained the water and refilled. I even took them all out of the bowl, rinsed them, then put them back in the bowl with fresh water. So — again, I figured they had soaked enough they would be fine. Again, part way through cooking when I had a taste they were NOT good. I hadn’t tasted before I added all of my other ingredients so dinner was almost going to be REALLY gross. But I just added water and let them cook and dinner was salvaged. But now I know. Apparently these beans HAVE to be cooked in order for them to be edible. When not cooked they are really HARD and they taste like a green seed. No good. Not the creamy mush you expect from a garbanzo bean. Also . . . these beans, while they have not popped as the other ones I soaked did, they are letting off a very large and stinky amount of gas! Whew! Again my kitchen smells of bean gas. They are gassy beans! I have yet to cook the rest. So . . . here I am again, just sharing things I learn. Maybe I can save someone’s dinner if they are like me and think that all dried beans can just be soaked without the cooking. I was fortunate in that what I was cooking was ok with me just adding water and letting it all cook a bit longer than I had planned. But somethings you can’t do that to. So if you are like me and you like the soaking method, try it on a small batch first to see if that will be sufficient. Please understand I am not saying there is anything wrong with these beans or the brand. I am just saying that I learned not all garbanzo beans can JUST be soaked. Apparently some need to be cooked too! 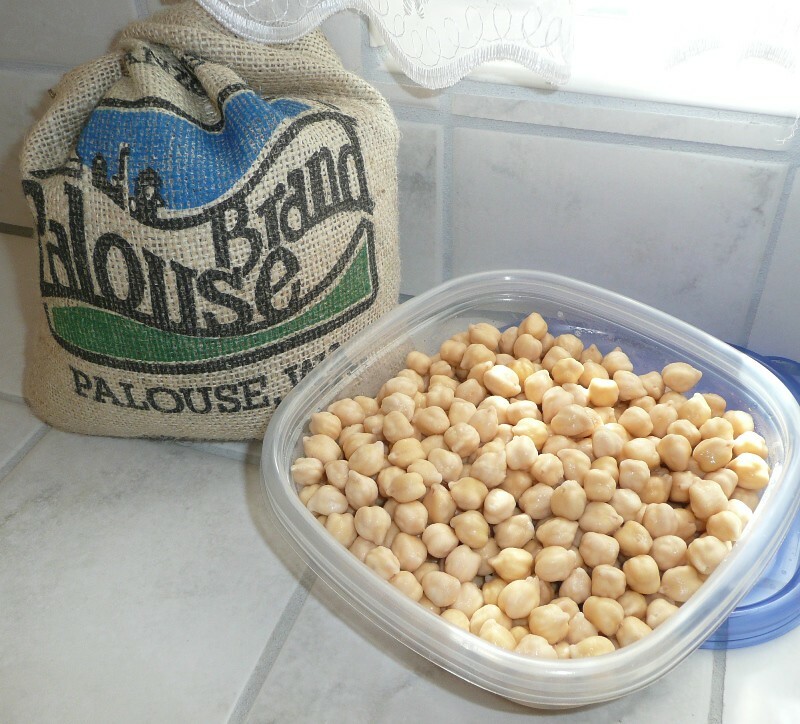 Do you have a recipe that you use garbanzo beans in? Care to share? 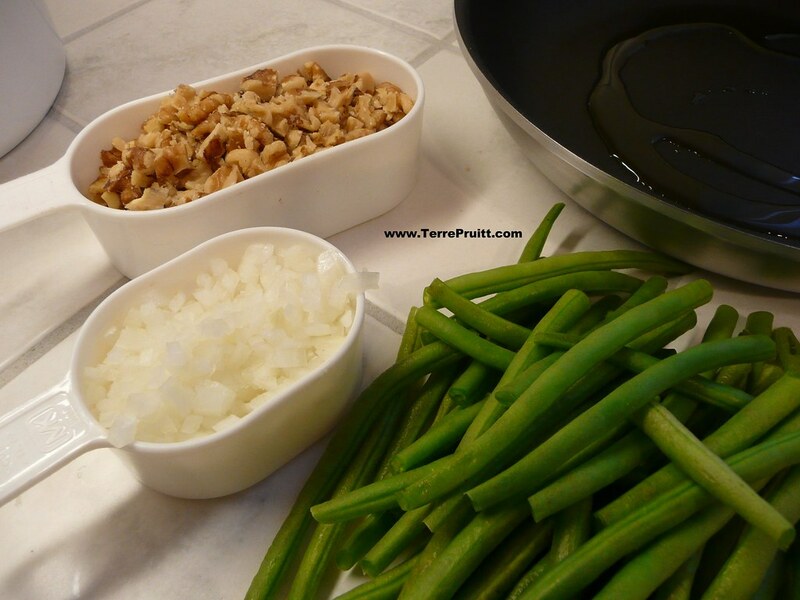 Since I recently posted a recipe with Green Beans, Walnuts, and Onions, I have been posting about the three main ingredients separately, for Green Beans click here and for Walnuts click here. I like onions. I like sweet onions, red onions, white onions, yellow onions, and green onions. I have actually grown to like them more as I get older. When I was younger I liked the flavor, but not the onion itself. I would pick them out of anything and off of anything. And I used to never eat them raw. I still don’t like to eat a lot of cooked onions and will often leave them on my plate if they are cut large enough and it is easy to move them out of the food I am eating, but I do actually eat them now. Also I will include raw onions in my salad. It all depends. When I eat them raw they have to be so teeny tiny you would probably laugh. Onions, however, are more than just for flavoring. Onions contain flavonoids. Flavonoids are what give the plant its pigment and have been linked to terms such as “cancer-fighting” and a lot of “anti-s” – antioxidant, anti-inflammatory, anti-cancer, anti-biotic, anti-allergic, anti-microbial, and anti-diarrheal activities. 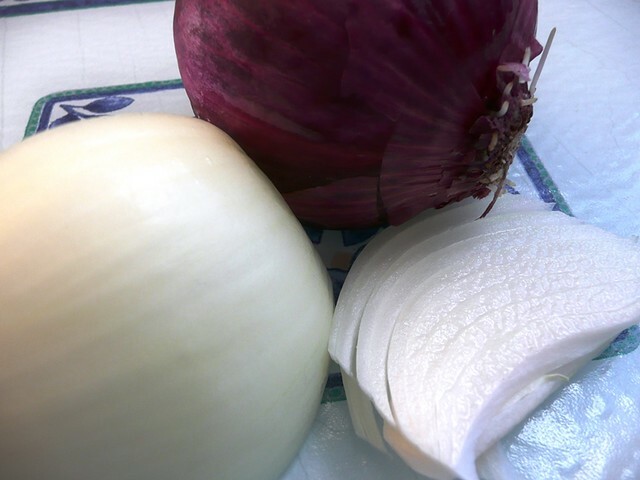 Onions store the flavonoids primarily in their skin. So the less you peel off the better. There is the red in a red onion (to me it is actually purple, but whatever) and the yellow in a yellow onion. The white has flavonoids too, but not as many as the red. According to PubMed, study was done that concluded the consumption of onions had a “beneficial effect on bone density in perimenopausal and postmenopausal non-Hispanic white women 50 years and older.” Wow. So it could be that eating onions helps with bone density . . . who would have thought. Onions should not be refrigerated, except for the green ones (scallions). We keep our onions in the fridge. I should change that. To me, onions are good in pretty much any type of savory dish. I don’t think onions go to well with sweet things, but sometimes it works, but usually the onion needs to be a sweet onion or a red onion. My husband does not mind onions with his sweet. Many people have strong feelings about onions. They either LOVE them or HATE them. Where do you stand? Do you love them? Do you hate them? Do you like them cooked? Do you like them raw? Did you know they had such great health benefits? Walnuts are awesome. As you may have read in some of my other posts, my hubby doesn’t really like walnuts. I find that fact rather funny because he likes pretty much everything, but he is not fond of walnuts. One day I had a bag of pecans on the table and I was having some for dessert. He grabbed a couple and ate them. As he was eating them he looked at me and said something like, “What? These are so good. Why did I not know these are so delicious? I am amazed!” I actually laughed at his reaction to them because pecans really are very yummy. They are rich and slightly sweet and he didn’t know the joy. Walnuts are different and he doesn’t care for them. I think walnuts are awesome. The thing I like about nuts is they can be used in sweet or savory dishes, or even eaten by themselves. Walnuts are a bit harder than pecans. Pecans almost feel stale or old because they are kind of soft. Walnuts are hard and they are not as rich, but they are very good and good for you. Walnuts have Omega 3 fatty acids in them. You might have heard that Omega 3 fat is the fat that we need to consume. Research has indicated that we don’t eat enough of it AND that it is a helpful and healthful fat. The Linoleic acid is the Omega 3 essential fatty acids. And it is the Omega 3 that we want. Omega 3 is considered an anti-inflammatory. As I have mentioned in numerous other posts, anti-inflammatory foods are a welcome part of a healthy diet. With more and more research pointing to the association between chronic inflammation in the body and disease, it is a good idea to consume foods with an anti-inflammatory effect. According to the World’s Healthiest Foods site: Research has shown walnuts to help with cardiovascular health. They have been shown to decrease LDL cholesterol, decrease total cholesterol, and increase omega-3 fatty acids in red blood cells. Also decrease the risk of excessive clotting and excessive inflammation. For me, as I mentioned they can be eaten in savory dishes, like with green beans (click here for a green been recipe) or in sweets. I like to put walnuts in my banana bread, but I don’t because John doesn’t like them and I primarily make the bread for him. But I do put them in the Banana Oatmeal Walnut Cookies (click here for that recipe). He actually is ok with them in the green beans and the cookies. I also think they are a great snack or dessert. Do you like walnuts? How do you like to eat them? I recently received green beans in the organic produce box we get. I made Green Beans, Walnuts, and Onions. LOVE THAT. So this past weekend I bought some green beans at our Farmers Market. I plan to make that again. It is so good. My husband even mentioned after I made it that he doesn’t care for green beans nor walnuts, but he loves that . . . what did I tell you? I like green beans. I don’t make them often because . . . well, you know. Sometimes, if I am not making the previously mentioned recipe, it is probably because I don’t have walnuts, so I just sauté the green beans. I don’t typically boil vegetables. I just sauté them cooking them only slightly. I like them to still have crunch when I bite into them. I don’t like soggy beans. I cook them basically the same as if I am cooking them for the recipe. Green beans are good healthy vegetable. Green beans are a great source of anti-oxidants such as Vitamin C and Beta-carotene. In addition to the anti-oxidants; Vitamin C and Beta-carotene, the rich color of green beans provide phytonutrients like carotenoids, another anti-oxidant. As a reminder antioxidants help the body reduce the inflammation. More and more studies are linking disease with chronic inflammation. You know my theory . . . food that can help our body reduce inflammation is something we want to add to our diet. Green beans can be eaten raw. Just munch on them like you would a carrot or a slice of bell pepper. Green beans also make a great addition to a salad. Cut them up and throw them in a green salad or a pasta. I love vegetables that can be eaten cooked or raw. When they can be eaten both ways it is almost as if they will be eaten more often because of the variety in which they can be eaten. I would eat them a lot more if my husband liked them. I don’t really like to make him eat stuff he doesn’t like even though it is good for him. It really is funny because these used to be the only kind of beans I like. Now I somewhat like garbanzo beans, and I eat kidney beans in certain recipes like my bean salad or red beans and rice (For Bean Salad recipe click here / For Red Beans and Rice recipe click here). So do you like green beans? Do you like to eat them raw? How do you like to cook them? 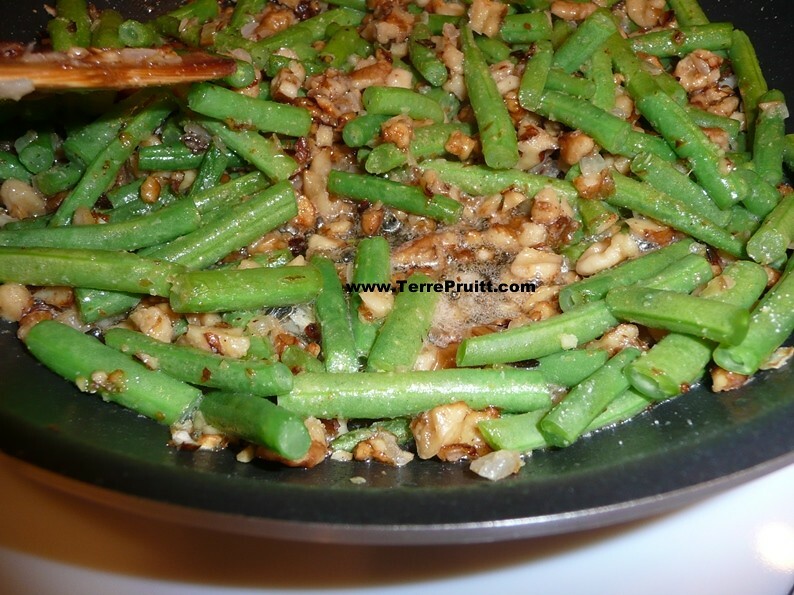 Have you tried the Green Beans, Walnuts, and Onions? I have shared before about how wonderful it is to cook for my husband because he pretty much likes whatever I cook. He is not a picky eater. When I first met him he did not care for walnuts at all. I also think he is not a big fan of green beans. But being the trooper he is he tolerated one of my favorite dishes. And now, even though he does not care for walnuts or green beans he likes this dish. I feel it kind of says a lot about how yummy it is. We received green beans in our produce box yesterday. I had just bought walnuts so I thought it was the perfect opportunity to make this recipe. We actually have not had this dish in a long time. It seems I usually have beans and not walnuts or walnuts and not beans. Since I had them both, somewhat in an unplanned fashion I thought, “YAY”. I like walnuts. I like green beans. Especially fresh not canned or frozen. 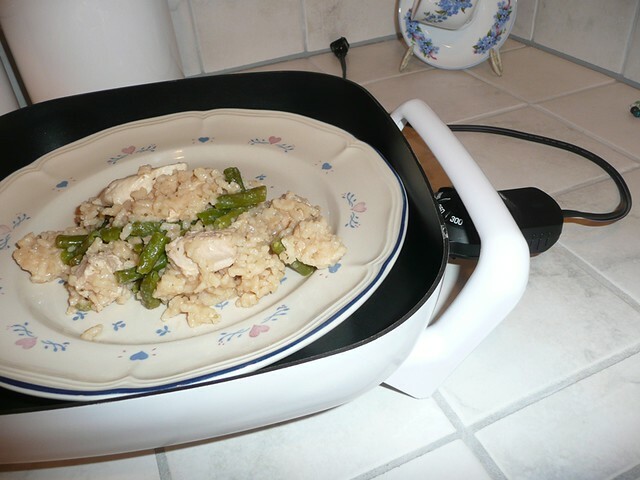 But this recipe will work with whatever type of green beans YOU and your family likes. In our box we received a half a pound of green beans. So this recipe is based on that amount of green beans. I would normally like to cook more, but I only received a 1/2 pound. As with all recipes adjust as you see fit. This is a guide to help you on your way. Heat up the onions in the oil in a pan. Cook them until they are just starting to turn translucent. Then put in 1 tablespoon of butter. Let the butter melt. Add the walnuts. Cook the walnuts to just when they are starting to get light brown from cooking (I know they start out brown so when you see them staring to be toasted). Then add the green beans. Add more butter. Then add the garlic salt. Cook your green beans to your liking. I like mine still crunchy. Serve. Oh this is such an easy yet yummy side dish. The butter and walnuts add a richness. Of course, you adjust all ingredients to your liking. I would suggest cooking the walnuts less before you add the green beans if you like to really, really cook your green beans. The idea is to toast the walnuts not burn them. And it could be that if you cook the green beans for a long time the walnuts will get over cooked. Also you can see that I like my ratios to be about even. You might want a higher bean to walnut ratio. So please . . . play with it and find what works best for you. This could be your starting point. 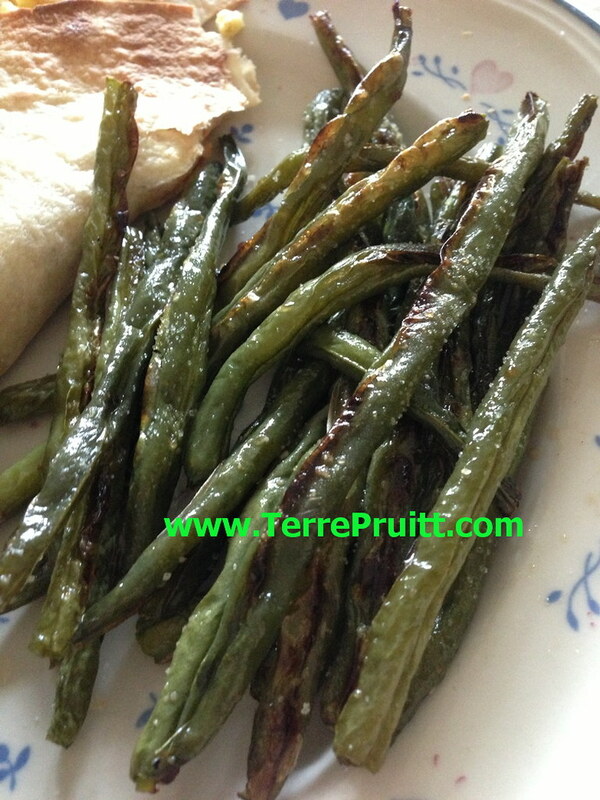 I know that I have used frozen green beans before and it is just as yummy. I am sure that whatever green bean you like to eat will work. What type of green bean do you like?